Senior guard Darius Miller of Kentucky shoots during the Wildcats' win over Baylor in the South Regional final. Kentucky, the NCAA Tournament's No. 1 seed, faces rival Louisville in the Final Four Saturday. Kentucky is the lone No. 1 seed to make this year's Final Four. Both Kansas and Ohio State are No. 2 seeds, while Louisville was seeded fourth. Of the four teams, Kentucky is the only one to score more than 80 points in every game it's played in the 2012 tournament. Earlier this week, when Mark Memmott asked Two-Way readers to predict who would win it all, Kentucky emerged as the clear favorite, followed by Kansas. By his count, NPR's Mike Pesca has attended 18 games in this year's tourney. And as he tells Morning Edition co-host Renee Montagne in an interview to air Friday, this year hasn't brought the flurry of buzzer-beating shots and standout performances that defined recent tournaments. "But what there has been, and what there always is in college basketball, is emotion," Mike says. "And I think that's what brings people back to college basketball." Saturday's action will tip off at 6:09 p.m. ET, when the Wildcats and Cardinals play for bragging rights in Kentucky. The next game follows at 8:49 p.m. ET. The games will be on CBS — or, if you're hoping to watch in person at the Superdome, tickets were available Thursday afternoon. Prices ranged from $225 in the nosebleed seats to $6,750 for a second-row spot along the sideline. "Coming in, I think people knew that Kentucky was the best team, but they didn't realize how good they were — maybe because Kentucky is now playing its best basketball. They're great on offense, and they're spectacular on defense." "I think... if there's one with a chance, it is Louisville, just because Rick Pitino is a really smart coach, and a really good tactician. And he has six days to prepare for this game. And if someone's going to beat Kentucky, I don't think you do it with athleticism; I think you can possibly outwit and confuse them. Then again, Kentucky plays a tight game... you know what? It probably won't work. But if it will, I think Rick Pitino is the guy to do it." "Ohio State probably had more highly recruited players, out of high school. Their best player is Jared Sullinger, who is 6'10, and bruising. Yet he's not a big dunker or a high flier; great at jumpshots." "Kansas has actually overachieved. They have very good players; tons of schools would trade their rosters for Kansas'. But considering that Kansas usually has a top-5 recruiting class, they don't have any McDonald's All-Americans on their roster. It just goes to show you what a good job their coach, Bill Self, has done. This will be a good game." On Monday, Mike will be back on Morning Edition to discuss the title matchup. And as in the rest of the tournament, he expects there to be no shortage of emotion in the championship game. "Because it's a one-and-done situation, not a long series — and because these are kids who might never get a chance to be on the national stage, there's a lot of crying at the end; there's a lot of hugging during victory," he says. "And I think that is the hook, and will continue to be the hook, for this NCAA Tournament." The Final Four of men's basketball tips off tomorrow in New Orleans. University of Louisville plays University of Kentucky, Kansas plays Ohio State. NPR's Mike Pesca will be at those games, as he's been during the tournament thus far. MONTAGNE: So now this is a list of blue chip schools. They've won 13, between them all, NCAA basketball titles and appeared in 49 Final Fours. How much will experience count? PESCA: I think, strangely, not a lot, at least when you're talking about the players. You know, the coaches certainly have been there. All the coaches have appeared in Final Fours before. And Rick Pitino has won a title and Bill Self of Kansas has won a title. But these players are freshmen, sometimes sophomores, and they have blinders on. And, you know, that can be a good thing. Rick Pitino and John Calipari have both said much has been made about the game that we're going to play on Saturday. It's an in-state rivalry being played on a national stage. But our players don't actually come from Kentucky or come from Louisville, so they don't know about this. And that actually could be an asset. Just play the game of basketball and forget about, you know, this blood feud that's been going on for 50 years. MONTAGNE: OK. Let's talk about this Kentucky team. They've been so dominant during the tournament. What do you think? Can they be stopped? PESCA: They have been absolutely dominant. Coming in, I think people knew that Kentucky was the best team, but they didn't realize how good they were. They're great on offense and they're spectacular on defense. They, you know, can score 100, as they have in this tournament, and yet they hold opponents to 59 and a half points a game. That was their average during the regular season. So the odd thing is, that if you took all the three possible opponents against Kentucky, I would say that Louisville would have, in Las Vegas, the biggest point spreader, the longest odds to beat them. And people would say Louisville is the fourth best team in the Final Four. And yet, I think, of the teams, if there was one with a chance it is Louisville just because Rick Pitino is a really smart coach and a really good tactician. 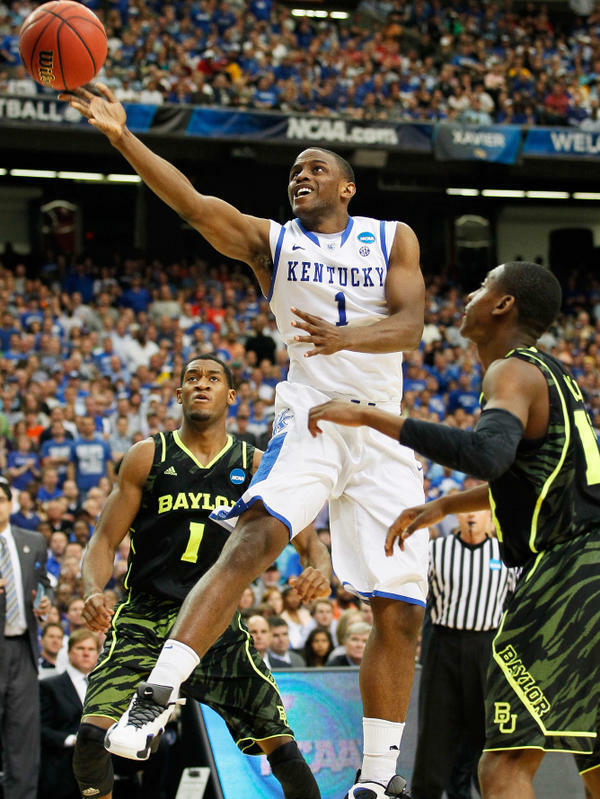 And if someone's going to beat Kentucky, I don't think you do it with athleticism. I think you can possibly outwit and confuse them. You know what? It probably won't work. But if it will, I think Rick Pitino's the guy to do it. MONTAGNE: OK. Talk to us about Kansas-Ohio State. What about that match up? PESCA: Great players in this game. Their best player is Jared Sullinger, who is 6'10 and bruising, yet he's not a big dunker or a high flyer, great at jump shots. Kansas has actually overachieved. They have very good players, you know, and tons of schools would trade their rosters for Kansas. It just goes to show you what a good job their coach Bill Self has done, always does. This'll be a good game, even though it's kind of being regarded as the under card. It is the later game and it'll be a really good one. MONTAGNE: And, Mike, going into the weekend - and you've been to many, many games so far. What has impressed you most about this tournament? PESCA: Yeah, I think I counted, I've been to 18 games. And, you know, it's not the quality of play. There've been a lot of missed shots. There hasn't been a buzzer beater. There hasn't, maybe, been the transcendent moment where one guy scored 35 or 40 points. But what there has been and what there always is in college basketball is emotion. And I think that's what brings people back to college basketball. Yeah, the bands and hoopla and the adherence to one's alma mater, that's all true. But because it's a one and done situation, not a long series, and because these are kids who might never get a chance to be on the national stage, there's a lot of crying at the end. There's a lot of hugging during victory. And I think that is the hook, and will continue to be the hook, for this NCAA tournament.